BEGUM FRANCES JOHNSON – GRAND DAME OF CALCUTTA. Budapest is one of the many beautiful cities in Europe. Spread out on the banks of the Danube with Buda on the hilly west and Pest on the flat east bank, the two portions are connected by eight impressive bridges. After a guided tour of the imposing buildings like Parliament House, Opera House and the numerous Roman Catholic churches in Baroque or Gothic styles, it is nice to enter a local tavern for a plate of gulyas (meat and vegetable stew) and a glass of wine. My other place of interest was Dunaharasti by the Danube, where Amrita Shergill of mixed descent was born on January 30th, 1913. Only a few years ago, an Indian HRD Minister had unveiled a plaque on the wall of this house. Ironically, the present occupant a tailor was unaware of its historic importance. I had seen Shergill’s paintings at the National Gallery of Modern Art in New Delhi, and was fascinated by her life and times. Amrita’s father was a Sikh aristocrat and also a Sanskrit scholar. Her mother was an upper class Hungarian pianist. Her parents were not the best of role models. While her father was grim and orthodox, her mother was a social butterfly with several peccadilloes under her belt. But she was the driving force behind Amrita’s achievements and encouraged her to work hard at her paintings. Amrita was head strong, opinionated and independent. She came down heavily on her critics though she herself was critical of the work of others. She believed she was a natural painter with ‘a peculiarity that resented outside interference.’ She was drawn towards colour and form just as she was to landscapes and nature. “I cannot contain my appetite for colour. I wonder if I ever will,” she said. At the age of eight, she moved with her family from Hungary to Simla, a hill resort in India. But a year later, she and her mother went to Italy, in pursuit of an Italian sculptor with whom her mother had fallen in love. Though Amrita was exposed to Italian masters of painting while schooling at Santa Anunciata, the regime of the convent was restrictive and she returned to India. Some say she was dismissed for proclaiming that she was an atheist. In India, she studied under Erin Backlay for two years, but didn’t like the way he used live models. So she left. In 1929, she was sent to Paris for a degree in Fine Arts. At sixteen, she studied at the Ecole des Beaux Arts in Paris, learnt to read and write French, and also painted vigorously. She was exposed to the best Art Galleries and Museums in the city. Amrita was greatly influenced by the work of Cezanne and to a lesser extent Gauguin. The use of colour, techniques to represent depth of models, the intimate relationship between form and colour, was what she learnt from the work of the great masters. Amrita was the youngest and only Asian to be honoured as Associate of the Grand salon in Paris, for her painting of young girls. She captured on canvas sad child brides, powerless submissive women, beggars, vagrants and scenes from village life. “Her art moves from melancholy to tragic,” says Salman Rushdie. Amrita had a Bohemian lifestyle, was fun loving, glamourous, and like her mother an inveterate flirt. It was said that she even had a crush on Nehru. Flirting was her way of reaching people’s minds through their bodies. In 1938, she went back to Hungary and married her cousin Dr. Victor Egan, much against her family’s wishes. They thought he was lazy, idle and irresponsible. A year later, she returned to Simla with her husband, who found a job as physician in her uncle’s sugar factory there. In 1941, this happy wanderer and her husband moved to Lahore, as she had fallen out with her family. But she died prematurely at the age of 29, on December 3rd, 1941. Some said it was due to bacillary dysentery, but many were not convinced. She didn’t live to see the exhibition of her painting which opened at Lahore, two days later. Amrita Shergill will be remembered for her prodigious collection of paintings and unique style. There are about 147 of them. 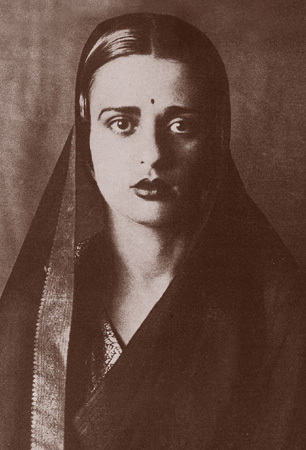 This young woman paved the way for a contemporary style and freedom of expression in Indian painting.